The world is becoming more interconnected every day, and Christians need to be well equipped for cross-cultural service. 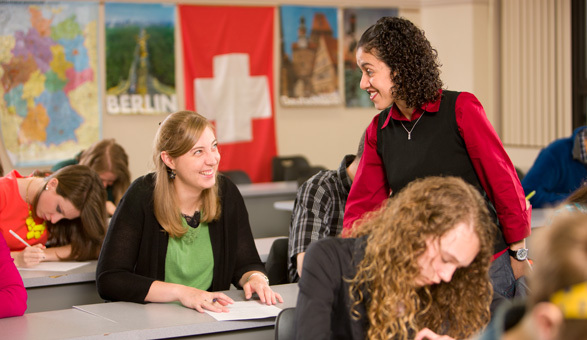 BJU’s international studies program is specifically designed to meet that need. Classes in social studies, history, business and a foreign language, combined with the BJU Core, all work together to provide you an excellent education that develops your biblical worldview and cross-cultural skills. When you graduate, you will be well prepared to meet the challenges of cross-cultural service in the 21st century and well equipped with the knowledge and skills you need to navigate cross-cultural interactions successfully. The international studies program at BJU is multidisciplinary, and you’ll have some flexibility to customize your program. Within international studies you’ll take courses such as Economics for the Professional, Cultural Anthropology, and Comparative Politics. The broad base of knowledge and the exercise of analytical and communications skills you’ll gain from classes like these ensure that you’ll be ready to contribute effectively in a variety of situations. Acquiring the skills to communicate in a foreign language is an essential part of your education. Whether you choose Spanish, French, German or Chinese, you’ll find that adequate preparation in a foreign language is a definite advantage in cross-cultural interactions. For the capstone project for your program, you’ll research and write a paper on an issue related to international studies. Recent papers by students have explored topics such as the role of women in the military and the problem of the loss of World War II memorabilia and graves in the South Pacific. This project is designed to challenge you to apply your research, analysis and communication skills to a significant real-world problem or question, perhaps laying the foundation for future research or action. The BJU Core is a unique combination of liberal arts and Bible courses taken by every BJU student. Bible courses, as well as daily chapel services and godly professors, will nurture your growth in Christlikeness. As your biblical worldview is strengthened, you’ll learn how to apply the timeless truths of God’s Word to difficult questions that may arise cross-culturally. You’ll also be refreshed and encouraged by how the body of Christ transcends borders, cultures and races. Liberal arts courses will further broaden your horizons, enabling you to connect with people from all walks of life. These courses will also equip you with skills essential for cross-cultural work and for all of life—skills such as critical thinking, problem-solving, effective communication, ethical decision making, adaptability, and much more. A variety of electives are already included in the international studies program, from communication to history to political science. You may tailor your program with more courses in an area such as business, or with courses in teaching English as a second language, linguistics or missions. I’m deeply thankful for the training I received at BJU. While preparing me for my career, my professors also took the time to develop me personally. They instilled an appreciation for academic rigor and discipline, for creativity and the beauty of culture, and for truth and the skill to communicate it with grace. Their coursework gave me a broad understanding of global culture and international relations, emphasizing the role of geography, anthropology, and the dynamics of modern multinational states. I also benefited from courses in language and business, as well as electives that gave me training in computer science and publishing. My teachers also gave me a strong foundation in research, challenging me to synthesize diverse perspectives, pursue critical feedback, and value iteration. These principles guided my study in Beijing during the summer after my sophomore year, which in turn led to the publication of a peer-reviewed paper on Chinese policy during my senior year. None of that would have happened without the encouragement and advice of my professors. Today I have the privilege to work with people from a variety of backgrounds—educators, writers, editors and translators from around the globe. Thanks to the work of my professors, I have the chance to build bridges across many cultures, all through a shared appreciation of truth, beauty and the gospel of grace. The University Language Association is a student-run organization that brings in speakers from various countries and occupations to give you opportunities to see the connections between a foreign language, such as Chinese or Spanish, and future careers. You’ll also learn about needs in Christian ministries around the world so you can give of yourself through prayer and other means for the glory of God. Because international studies is an interdisciplinary program, you’ll learn under great faculty who teach in various subject areas, such as TESL, foreign languages and business. They’re involved in the community, in groups such as Upstate International, which extends a welcome to people from other cultures to the Upstate. In addition to their practical experience in the field, nearly all of your faculty hold terminal degrees or the equivalent and teach in their areas of expertise. Communicate effectively in cross-cultural settings. Evaluate different political systems and economic theories. Assess global political development in the modern era. Apply biblical principles in cross-cultural settings.